1.2 What is coconut water? 2.2 Where to buy coconut water? Coconut water is the liquid endosperm of immature coconut, the fruit of the coconut palm (Cocos nucifera L.). Often coconut water is confused with coconut milk or Santan. The difference lies in that coconut milk is a liquid extracted from mature coconuts, while coconut water comes from unripe coconuts. The fact that this drink is extracted from Immature coconuts implies it has not yet accumulated fat and it presents a low sugar content. Coconut water is rich in potassium, so it helps to naturally replenish fluids. For thousands of years coconut water has been a staple of tropical populations who currently still consume this healthy drink regularly. In countries where it grows, coconut is harvested when still green, by means of climbing the slender palm tree until being able to reach its fruits. Coconuts are broken and the milky liquid inside is drunk directly . Currently the coconut water drink, marketed under the brand Zico, belongs to Coca- Cola Company. Recent research suggests that coconut water, as well as nourishing and moisturizing, can possess medicinal properties (see listing above). 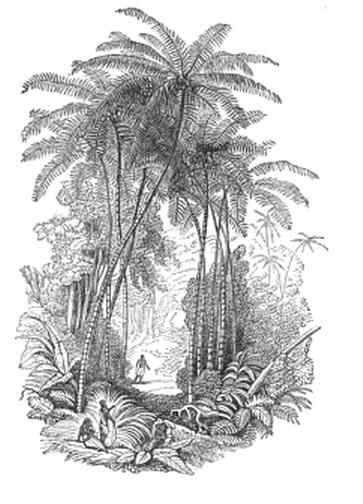 In the picture: old illustration where you can appreciate the great height of the coconut palm, which can reach 30 meters. Water: the immature coconut liquid is a very hydrating beverage containing more than 90 % of water. In contrast, in the mature coconut, this liquid water content decreases to 50 % of its composition, making coconut milk, an ingredient used in cooking as cream. Notably, coconut milk and coconut drink are quite different two drinks. * View: Properties of the coconut milk. Calories: Coconut water is a very low caloric drink, providing only 38kcal per cup (200ml). It is therefore an ideal drink for people who are in the process of thinning. Carbohydrates: The carbohydrate content is low, as the unripe fruit has not yet accumulated fats and sugars. Per 100g. coconut water possesses 3.71 g. of carbohydrates, a low amount. Proteins: coconut water is not a good source of protein, because its content is very poor in this nutrient. Fat: It contains almost no fat . Being a plant food with no cholesterol, since this substance is unique in the animal kingdom and plants can not manufacture it. Fiber: this drink provides a healthy amount of 2 grams of fiber per serving (200ml glass.). Vitamins: We must highlight its contribution in B vitamins, especially energy functions. The amount of vitamin C is low. It does not provide vitamin B12. Minerals: Coconut milk contains many minerals and trace elements (minerals found in the body in smaller amounts). Among the most notable minerals we find potassium (diuretic effect); phosphorus (energizing mineral); selenium (a powerful antioxidant) and chromium (It helps regulate blood sugar levels). Coconut water is a very hydrating drink shown to complement any healthy diet. It is a a natural isotonic drink. For its excellent balance of minerals, this drink is a must in the plan of hydration of any athlete. Containing potassium, antioxidant vitamins and minerals that contribute to recovery after sport. Because it is a lowsugar drink, coconut water is recommended for weight loss phases. In addition, its potassium content brings heartqualities. Scientific studies have shown its hearthealthy properties, vasodilating and helping lower bad cholesterol. Suitable for people with diabetes and people with hypertension. Where to buy coconut water? – Out of the countries from which coconut grows, coconut water is marketed by Coca-Cola Company under the name of Zico. This new drink is marketed only in the U.S., the UK, Spain and in the future, France. It can be found in gourmet shops, supermarkets, gyms and premium sport centers.